I struggle with snacking my way through the workday. I try so hard to make healthy choices but those usually leave me starving after just a couple hours. 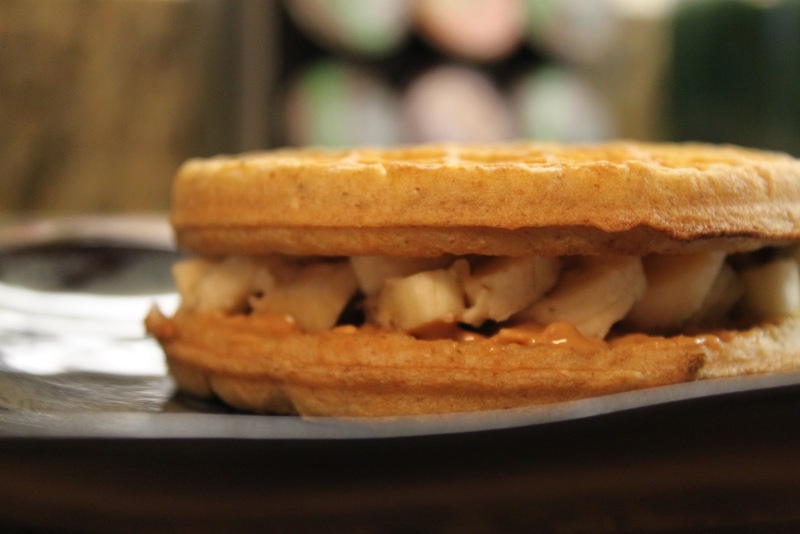 Luckily I found this healthy solution: Peanut Butter Banana Waffle Sandwiches. I typically eat breakfast around 8am. And instead of ravaging my snack drawer around 11am, I was full clear until 1pm! Score! Toast the waffles, smear one tablespoon of peanut butter on each waffle, slice the banana, assemble the sandwich and voila! A 430-calorie breakfast that won't leave you searching for more food an hour later. What's your trick to staying full without consuming a ton of calories? Don't forget to enter my Viola Jane giveaway to win the adorable gold sequin collar necklace HERE! this sounds good! I think I'm going to try it tomorrow morning! This sound good and yummy photos.